Aichi University opened its new Nagoya campus in April 2012 in the Sasashima Live 24 Redevelopment District close to Nagoya Station. 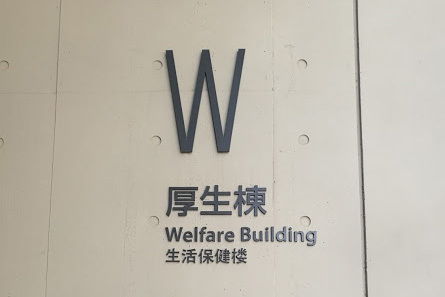 In this district, which is positioned by Nagoya City as the base for international hospitality and exchange, the university has brought together three faculties of social sciences and two faculties of international studies. Some joint projects with the Japan International Cooperation Agency (JICA), also located in the same district, are already under way. The district is a place where people from around the globe gather, offering opportunities to be open to and get in contact with the world. This new cosmopolitan town bustling with the latest trends of the current era is home to the Nagoya campus. 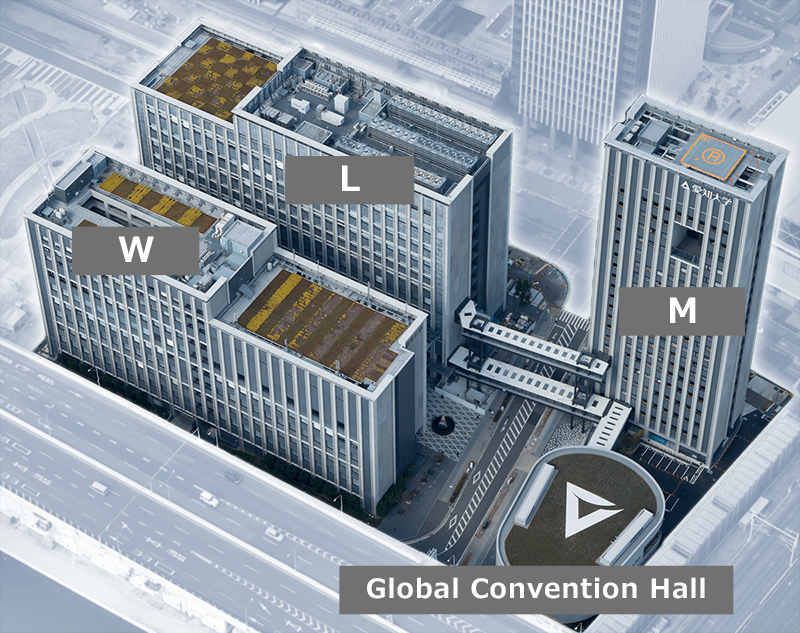 The Nagoya Campus comprises three buildings – the Main Building (research building), the Lecture Building, and the Welfare Building – and the Global Convention Hall. With an efficient layout of all functions necessary for education, research, and extracurricular activities, the campus allows for a smooth transition between classrooms. There are many free spaces suitable for voluntary and self-motivated learning on the campus, including discussion rooms in the library and the Learning Commons. 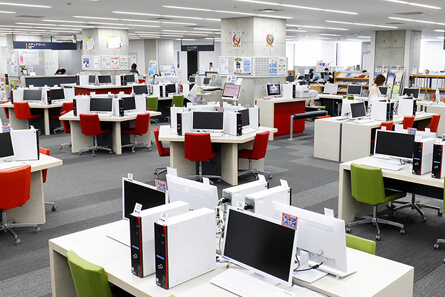 In these facilities, students can do research for a seminar or write a report using a borrowed PC, making effective use of their spare time between classes. Thus, the campus offers a greatly enriched learning environment. 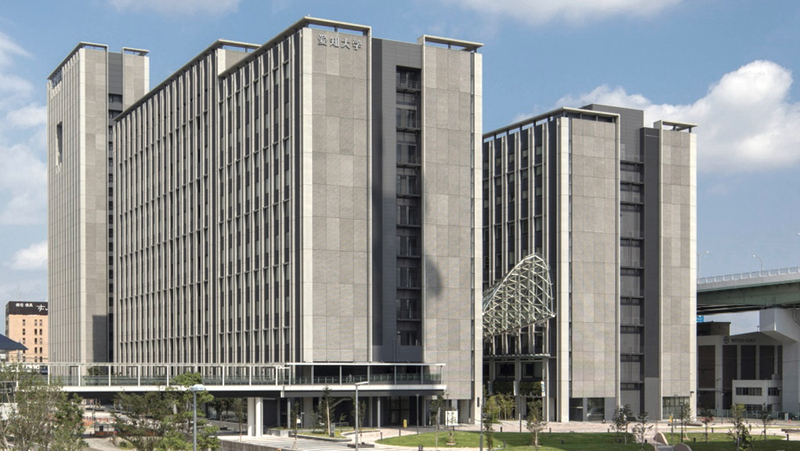 The Sky Lounge, newly furnished on the 20th floor of the Main Building, which commands a panoramic view of Nagoya Station on the northern side and the Kanayama area and the Nakagawa Canal to the south, serves as a common space for free communication among students and faculty members. The Main Building (research building) is also equipped with “Ecovoid,” an effective natural-air ventilation system using the prevailing winds, realizing an environmentally friendly campus. Nagoya is a city representative of the Chubu region. 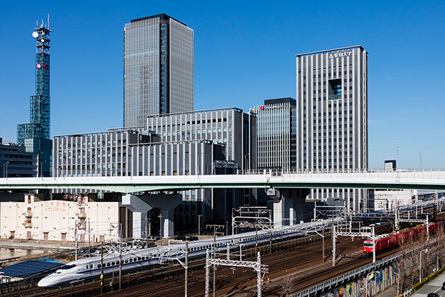 Nagoya Station, which serves as a gateway to the city, connects the city with major cities in the Tokyo Metropolitan area and the Kinki and Chubu regions by rail. Moreover, Chubu Centrair International Airport and the Port of Nagoya helps expand the city’s global network. With the Linear Chuo Shinkansen Line due to start operation in 2027, it is expected that the city’s urban functions and global competitiveness will be further enhanced in the future. In the area to the south of Nagoya Station, Sasashima Live, an urban area that is being developed as a hub for international interaction and hospitality by Nagoya City, is located approximately ten minutes’ walk from the station. We found that the development concept for the area matched our founding spirit, so we opened our Nagoya Campus in this area in 2012. In 2015, we signed a partnership agreement aimed at developing the local community with the Housing and Urban Planning Bureau of the Nagoya Municipal Government. The second phase construction of the campus was completed in March 2017, and the Sasashima Live area was opened in October in the same year. With the campus harmonized with the city’s most newly developed area with various information dissemination capacities in the fields of politics, economy, culture, and international exchange, you will feel a close connection with society through daily learning. In addition, a new plan is being developed to establish water access from the Nakagawa Canal (water space) to the Kinjo Pier via the Lalaport shopping center. The Sasashima Live area, which also contributes to enhancing the convenience of tourists, will continue to develop in the future. The Campus Mall is an all-weather, half open-air space between the lecture and welfare buildings. Measuring about 18 meters in width and about 100 meters in depth, this wide space is open to the general public and plays host to various local events. As the glass ceiling covering the 27 meters of the rear end of the space has been technically proven to be safe, there is a plan to use the Campus Mall as a temporary evacuation area in a time of disaster. The monument installed at the entrance of the Campus Mall is called the Tower of Love, which was created by Mr. Reiji Hiramatsu, a Japanese-style painter and graduate of Aichi University, to commemorate the opening of the new campus. Made up of three triangles, the tower symbolizes the initial of Aichi University - the letter of A - while at the same time representing his pride toward his university and hometown. Aiming to improve the foreign language skills of students, the Global Lounge provides them with an opportunity to experience international interaction and cross-cultural encounters through communication with foreign instructors and international students on the campus. 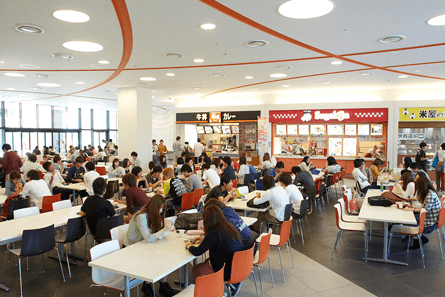 It holds various international interaction events, including the International Café, in which Japanese students and international students interact with each other during the lunch break. The Learning Commons is a study space for active learning. It provides students with a space to develop ideas and express their own views through group learning, write a thesis or report, create a PowerPoint presentation, or practice giving a presentation. The library has a seating capacity of 880 and houses about 400,000 volumes. Using the book search system, students can search the book collections of the other campuses. The lecture building has a number of classrooms of different sizes with seating capacity of 30 to 600. Lectures are given, making full use of an ICT environment and audio-visual equipment. The Media Zone is furnished with PCs, ICT devices and group workrooms, all of which are freely available to students. The food court, directly connected to the Campus Mall, is a place for interchanges between students and local residents. The combined seating capacity of the food court and the on-campus restaurant is 740. 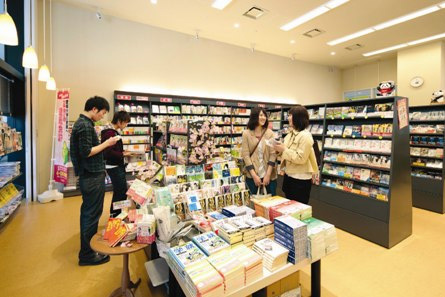 On the first floor of the lecture building are a co-op store and a convenience store, where students can purchase practically anything they need for their campus life, from stationery to commercial publications and textbooks. Equipped with a four-language simultaneous interpretation booth, this large hall can accommodate 600 people. 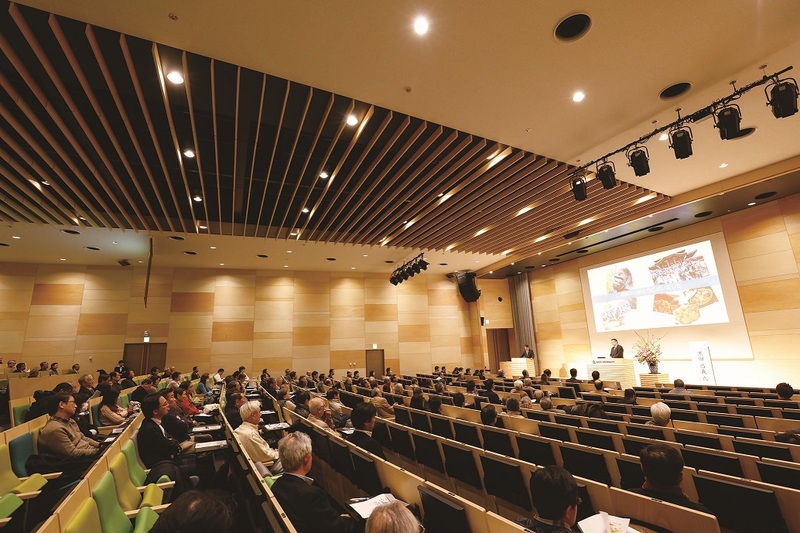 It can be used for various purposes, including the holding of international conferences, symposiums, and academic meetings, as well as events focusing on presentations given by students. Various kinds of facilities intended for physical education classes and sports club activities, as well as student club rooms and a sound studio, are available. A dedicated sports ground for students at Aichi University was established in Kanie Town, Ama District, Aichi Prefecture in April 2014. With a baseball ground, tennis courts, a soccer field, and other sports fields, this ground is also equipped with changing rooms and resting rooms. 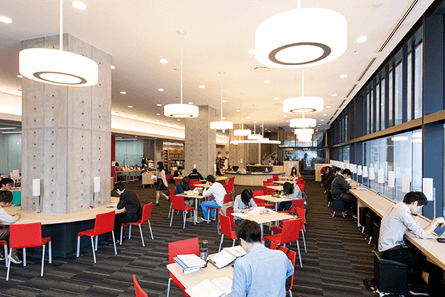 The Nagoya campus adopts the concept of color universal design for diverse users. The on-campus signs are in three languages (Japanese, English and Chinese) to accommodate the needs for international hospitality and exchange. 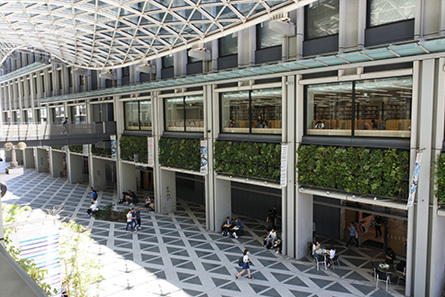 The campus also has an underground air conditioning plant for the local community and supplies cooled or heated air to the Sasashima Live 24 Redevelopment District. The other eco-conscious measures implemented on the campus include wall and roof greening and dry mist spraying. Planning of a town that will be a cooperation base of industrial, administrative, and academic sectors connecting Greater Nagoya with the world.